What is the hypergrid? And why should business care? Because it’s starting to look as if this is the future of the Internet — and it will change the way we all do business. According to University of California at Irvine professor Crista Lopes, a hypergrid is a like that three-dimension chess set that Spock plays on Star Trek. Every individual chess board is a grid. The squares on the chess boards are the regions in the grid. And when pieces move from one chess board to another, this is like hypergrid teleporting from one grid to another. But say you don’t watch Star Trek, and don’t play three dimensional chess. Here is another explanation of the hypergrid. A single grid is like a website. Every company can have its own, on its own domain. A website is a flat page, and grid is a map that you can put buildings on, create mountains and valleys, walk around in, interact with other people in it, and interact with the environment. The grid is flat. If you walk far enough, you will fall off the edge. And the sun revolves around the grid, and the stars are painted on the sky. I guess it’s true that if you wait long enough, all ideas eventually come back into fashion. The same way that a company’s website can have many pages on it, so a grid can have many regions. Each region is a sixteen acres square — about the size of sixteen football fields. 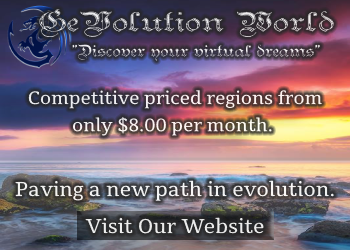 If you were so inclined, your virtual character — your avatar — can walk from one region to the next, or fly between regions, or teleport between regions. Now, if your company has a website, and another company has a different website, Internet users can move across them in a number of ways. They can click on a hyperlink. Or type a new address in the address bar. Or they can find the other site in a search engine. 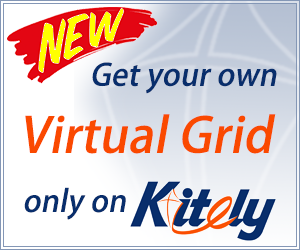 Similarly, hypergrid users can jump from one grid to another by following a hypergrid teleport link (often in the shape of a blue “Stargate”-style portal), or by clicking on a link in a search engine (such as Metaverse Ink), or by typing in the new address directly. Well, do you remember the days before the Internet? There was just one website — or a proto-website — called AOL. You dialed it up on the telephone, and you could chat with total strangers, read news articles, check sport scores, read your emails, and type in “AOL Keywords.” Remember those days? There wer also a couple of runners-up, such as Compuserve, and a bunch of special-purpose bulletin boards. For the most part, none of these connected to the others. If you wanted to leave, say, AOL and log into Compuserve you would have to hang up on AOL, get a Compuserve account, then dial into Compuserve. Today, the virtual worlds work much the same way. Whether it’s a role playing game like World of Warcraft or a large multi-purpose community like Second Life, it’s not easy to leave one and go to the other. If you are the only website on the Internet, then everyone comes to you. If you link out to a potential competitor, then the only thing that can happen is that people will leave you and go to the other guy. It’s a no-brainer. That’s why AOL didn’t rush out to embrace the Internet when it first came out. Do you remember the excuses? The Internet was too unstable. Too unreliable. There were all sorts of crazy people out there — AOL would keep you safe. Yeah, well, who wants to be safe, anyway? After the Internet standards came out, going online became much simpler and easier for organizations of all types — businesses, colleges, and individuals. The first websites were lousy compared to AOL. They looked bad. They weren’t as functional. They crashed a lot. Today, the OpenSim worlds — the new immersive, three-dimensional Internet — aren’t as pretty as Second Life. Second Life has more people. More companies. It’s got more stores and more content of all kinds. Everyone and his brother is on Second Life — there are over 200 colleges and universities alone in Second Life. Everything works just a little bit better in Second Life. The platform evolves steadily, at a measured pace. Content and operations are all centrally controlled — at least, to the extend that Linden Research, Inc. decides to control them. There are two main advantages that OpenSim has. One is that its modular open-source software allows grid owners to easily modify the platform to suit individual needs – by plugging in a new physics engine, for example, for better gaming, or a payment system for a virtual shopping site. The other advantage of OpenSim is the hypergrid. Any grid operator can decide to link their grid to the hypergrid and allow visitors from everywhere in the virtual universe to come and visit, look around, maybe buy a few things. Without logging in. Without creating new accounts. Unless, of course, they want users to create new accounts — after all, many websites today are still password-protected. It means that the Internet is about to become more more personal. There will be a feeling of “actually being there” when people visit your company’s world. They can walk inside buildings, sit on furniture, try on products, show their friends around, talk to staff. With falling travel budgets meetings and conferences are already starting to become virtual — this trend will only accelerate. The only difference is that today, users have to create a new avatar for each conference (unless they’re lucky enough to be attending all their conferences on the same virtual world) — with the hypergrid, users can come with the avatar they already have, and collect materials and make contacts using their permanent virtual persona. Over time, virtual worlds will start to replace Web applications as the preferred place to work. Interacting with physical objects is easier and more intuitive than interacting with drop-down menus and mouse buttons. People already laugh at me for suggesting this. Aren’t virtual worlds for games? But do you remember when the Mac was considered a toy? When real people used DOS and would never — never! — condescend to using a mouse or clicking on little icons like children? Look around. The kids all have avatars. The colleges are teaching classes in virtual environments. And consider IBM. How many typewriter companies successfully made the transition to mainframe computers? How many mainframe computer companies successfully transitioned to PCs? How many PC companies were able to embrace the Internet and start delivering services? Today, IBM is one of the biggest backers and one of the biggest users of OpenSim. Now, this isn’t a 100% guarantee that OpenSim will win and become the standard of the new Internet. Someone, somewhere in a garage, could well be inventing the next great thing. But it certainly looks like we’re all going to be on the hypergrid before we even know what hit us.